This culminated last week. But the war — between Peter Navarro’s economic nationalist camp and Gary Cohn’s free trader-cohort — has been roiling the White House for months. It came to a head in the Oval Office in January of this year, when Cohn, Navarro, Rob Porter, Wilbur Ross and John Kelly sat in chairs around the Resolute Desk for another standoff. Cohn tried to argue that these tariffs would ruin Trump's record-setting stock market streak and wipe away benefits of tax reform. But Trump kept saying Cohn was a "globalist" while he himself was an economic nationalist. After making his points, Cohn said there was no point continuing the argument given he'd laid out the facts. He moved to the couches and asked Ross and Navarro: "Where are your facts?" Navarro argued that Trump needed to protect the domestic industry, promote American jobs and show the world we were going to be tough on trade and this was the best way to do it. Porter argued tariffs would hurt the manufacturing industries that use steel and aluminum as inputs, tax American consumers, roil global markets, alienate allies and lead to retaliation. Trump sat and watched the fight. He occasionally interjected, saying things like "I need to take care of my base," "You can't have a country without steel," and "Peter, what do you say to that argument?" By the end, Trump told Porter he didn't realize he was such a "globalist." In the end, Trump decided he needed more information about the economic effects of aluminum and steel tariffs, which wouldn’t be ready for a while. So the White House would focus on tariffs targeted at China. This is an important point: Porter and Cohn were determined to prevent Trump from using an arcane section of trade law — Section 232 — to invoke a national security crisis to impose steel and aluminum tariffs. They thought they'd got Trump to agree to a sequence: first impose tariffs on solar panels and washing machines (already done); then impose tariffs on hundreds of Chinese products to punish China for stealing American intellectual property (this action was imminent); then only impose the steel and aluminum tariffs after that (though in their minds hopefully Trump would be satisfied after whacking China so hard and wouldn't feel the need to go further.) Lastly, they were considering an investigation into unfair foreign treatment of American car companies. In the interim, the Porter disaster happened, and Trump became more and more agitated with the direction of the White House. The day Hope Hicks announced her departure, he was hopping mad, raging at Jeff Sessions and furious about the avalanche of negative stories about Jared Kushner. Trump was angry, agitated, and fed up. So he cut “the globalists” out of the picture, told Ross and Navarro to bring him the tariffs he'd been demanding for months, and made the announcement. The process was so rushed that the tariffs don’t actually exist yet — the details haven’t been ironed out or legally vetted. The interagency process effectively died with Porter's departure — though several senior White House officials have told me they think Porter and Cohn were being too clever by half and were never going to succeed at staving off the president's wishes for hardline tariffs on steel and aluminum. The president promised his people tariffs and he demanded them from his staff for months. 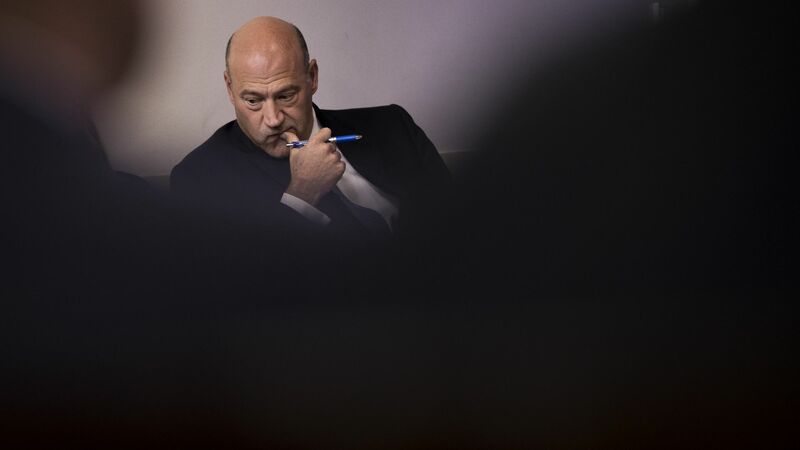 Bottom line: Cohn’s move to the couch, and Porter's departure, foreshadowed their defeat. And now that the White House’s inner battle seems at a standstill, a trade war may be poised to start. But a note of caution to the celebrating nationalists: If this rollercoaster process is how we got here, is this how it stays? Since there was no paper for the president to sign, when the lawyers go through it and Trump sees the reaction, does he still stick to 25 percent and 10 percent tariffs on everybody? We're betting Trump sticks to his tariff numbers but don't rule out carve outs for certain allies (even though Trump doesn't want to.) This fight is far from over. Get more scoops like this by signing up for Sneak Peek and our other Axios newsletters.